We know the Boston Celtics can show up to play when the stage is big and the lights are bright, but have had issues rising to the challenge of lesser teams consistently. How they will respond to playing one of the best players in the league, but on a team struggling to stay in the playoff picture? Against Anthony Davis and the New Orleans Pelicans, we have the perfect means of gauging exactly that question. Early on, things looked much the same, with Boston managing to botch the opening possession despite multiple cracks at striking first. Instead, Davis and the Pels did, with AD getting to the charity stripe on the next possession. Marcus Morris got the Cs on the board shortly after to tie things up, and Boston soon warmed up from deep, with Al Horford and Morris connecting while the Pels struggled to score. The Pels threatened to get back into it on a Davis make and a Jrue Holiday trey, but the Cs kept their foot on the gas early, going on another run as Horford and Irving started to heat up, giving Boston a 22-9 lead with six minutes left in the frame. The Pels responded with Wesley Johnson hitting a trey of his own, and Julius Randle added four quick points from the stripe and paint, and after several more trips to the line, looked to threaten Boston's cushion. Terry Rozier and Aron Baynes had other ideas, however, the former hitting a three to push the lead back 34-21 to end the quarter. Nikola Mirotic answered back to start the second, but Baynes and Gordon Hayward kept Boston's onslaught going, and treys by Marcus Smart and Semi Ojeleye threatened to push the lead above the twenty-point mark before Mirotic cut it down to 11. Boston kept the pressure on, though, with Kyrie and Smart hitting threes, but New Orleans started to find their shooting stroke, Mirotic treys and Davis layups cutting the Celts lead to 57-48 to finish out the half. 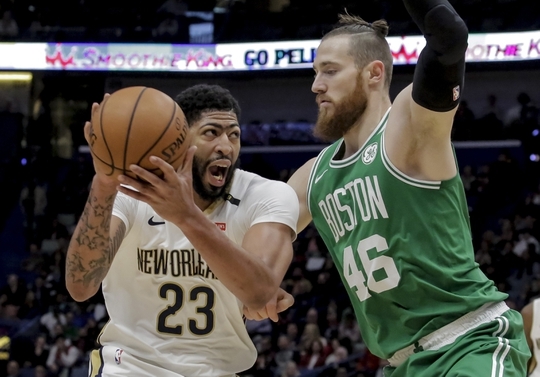 The third frame opened with a bang after Tatum yammed home a dunk, but quick threes by E'twaun Moore and Johnson gave the Pels their first single-digit deficit in some time at 59-56 Boston. A Mook trey and Irving layup pushed the cushion back to double digits, and a Kyrie-led run by the Cs would see them up 78-60 at the 5:30 mark. Anthony and Jrue would threaten to spark runs, but Rozier and Baynes kept Boston up big until a pair of Randall layups cut the lead to 89-79 to finish the frame. The final quarter began with Morris somehow delivering off a rebound off a late-clock midranger, with turnovers and Niko starting to cool off combining to slow the Pelican's resurgence. AD got himself to the line after a make, and again soon after, though, cutting the lead to 93-87 Boston with just under nine minutes to play. Threes from Al and Kyrie gave the Cs some space, and another from Hayward pushed the lead to 105-93 with six minutes remaining, but Davis and Holiday kept chipping at the lead, mostly from the stripe. An Irving trey and pair of Tatum buckets (including another great dunk despite Davis grabbing him) kept Boston well ahead, Boston going on a run and closing out in spectacular fashion with a Robert Williams oop. Boston crushed the Pelicans at home, winning 124-107, showing they can win a game on the road they've been losing at home; fingers crossed Brad Stevens sticks with the starters, and the team with this energy going forward.